Suffocation caused the death of a college student who was missing for nearly a month after slipping into a narrow earthen chasm in Anza-Borrego Desert State Park on Easter Sunday, the county Medical Examiner's Office reported Friday. Guillermo Pino Jr., 24, went missing while exploring mud caves with relatives and friends in the Arroyo Tapiado area, a locale nicknamed "the Badlands." Pino, a Scripps Ranch resident, disappeared about noon April 8, after his companions went into a cavern to get out of the midday heat. His sister told authorities they last saw him sitting on a ledge above a cave. Search-and-rescue crews combed the rugged locale in vain for about a week before suspending the effort. Last Saturday, a private detective hired by Pino's family found the remains of the UC San Diego psychology major by lowering a video camera into one of the crevasses that run through dried-mud slopes and precipices in the desolate area. 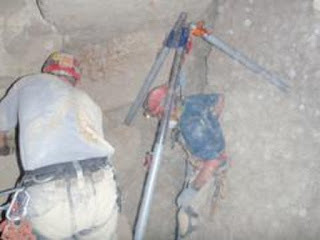 Due to a high danger of cave-ins, it took mine-rescuers several days to safely remove the body from the roughly 60-foot-deep hole, according to sheriff's officials. Both Montrose and Sierra Madre search and rescue teams were called to the scene. An autopsy determined that Pino succumbed to asphyxiation due to the position he landed in at the bottom of the fissure, according to the medical examiner. The time of his death was unclear.